There are four processors to choose from: Pentium G3250, Core i3-4150, Core i5-4590S, and Core i7-4790S. This is a very good mix of selection as you would be choosing between two dual core models, the Pentium and the Core i3, or two quad-core models, the Core i5 and the Core i7 models, depending on the features and performance needed. While you can pick dual-core models with any model, the quad-core model is only available for the six and eight bay unit. In addition to the processor, the RAM configuration is also different where the The Pentium and the Core i3 comes with 4GB of RAM as standard configuration while the i5 comes with 8GB base and the i7 double that amount to 16GB. Price-wise, they ranges $989 to $2199 depending on the configuration. QNAP makes it extremely easy with the model numbers to know which processor and the RAM is included. We can see that PT means Pentium, i3, i5, and i7 are designated for the respective Core processor. The last two places is designated the amount of the RAM included. So, what are the differences among the processors besides the number of the cores. First of all, there is clockspeed. The dual-core Intel Pentium G3250 processor clocked at 3.2GHz and the i3 model is the Intel Core i3 4150 is clocked at 3.5 GHz, or 300MHz higher than the Pentium. Though, we would expect higher performance than the 300MHz clockspeed bump as the Core i3 model supports Hyperthreading which would help with the heavily threaded tasks. Despite this, the two processors have similar TDP where the i3 is rated at 54W and the Pentium is rated at 53W. Neither processor supports Intel Turbo technology. The Graphics is also different between the two processors where the Pentium comes with Intel HD graphics (GT1, 10 execution unit clocked at 350MHz and 1.1GHz Turbo) and the i3 comes with newer HD 4400 (GT2, 20 execution unit, clocked at 350MHz, 1.15GHz Turbo). The GPU performance typically is not a factor in NAS, it is getting more usage since NAS now functions more than just a file storage server as it is capable of handling multimedia workloads and not to mentioning the capability of supporting ultra high definition 4K displays. Thus, we can expect a good sizable performance boost with the i3 model over the Pentium model. Feature-wise, the Pentium and the i3 offers similar feature set except the hardware AES encryption which the i3 supports but the Pentium model lacks, so this would be a major deciding factor besides the performance difference. Sadly, neither model supports support VT-D which would come handy due to QNAP’s unique feature of QvPC and virtualization. Luckily VT-x is supported so the performance under virtualization should still be decent. Those who just need a good performance NAS for home use, the Pentium probably would be sufficient but for business, Core i3 is probably what you would want for the higher performance and the hardware assisted encryption security. Need even more processing power, then the quad core model Core i5 and i7 are what you want to look for for. Both processors are 65W TDP desktop processor and supports Turbo. The i7 is clocked at 3.2 GHz (4GHz Turbo) and the i5 is clocked 3GHz (3.7 GHz Turbo). The i7 also gets extra boost with Hyperthreading that the i5 is missing. Graphic is the same on both CPU which is the Intel HD 4600 clocked at 350MHz but the Turbo clock is a tad higher for the i7 at 1.2GHz vs the 1.15 GHz on the i5. Feature-wise, the two are pretty similar as they both support vPro, VT-x, VT-d, EPT, Intel My WiFi technology, Intel Identity protection, and Intel Stable Image Platform program, AES encryption, and Secure Key. Our review unit, the TVS-471-i3-4G is retailed at $1134.99, pretty good pricing for a 4-bay unit with such high performance processor. 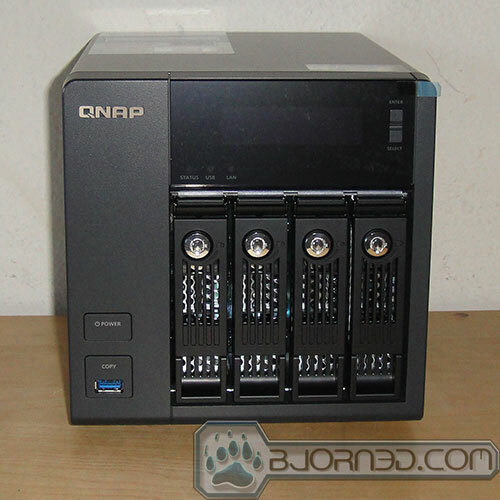 As always, QNAP ships the NAS in a very attractive box with tons of information detailing what the unit’s feature. Inside, we can see that the NAS is surrounded with padded foams to protect it during the shipping. 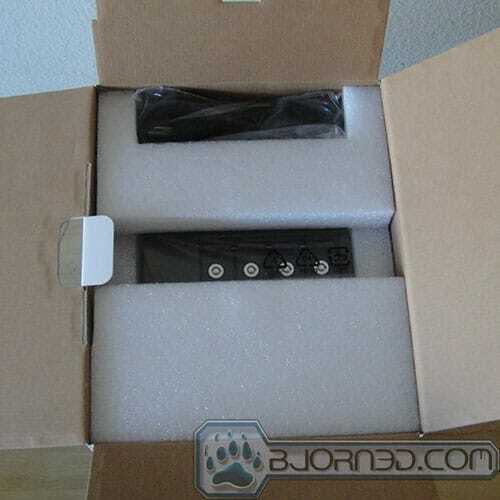 The accessories and power cable are placed in a separate box. QNAP ships the unit with four Ethernet cables, a power cable, two bag of screws, two sets of keys for the hard drive, and two additional brackets. We have always loved QNAP’s metallic exterior that is made with high quality material which not only looks great but also helps the cooling performance. 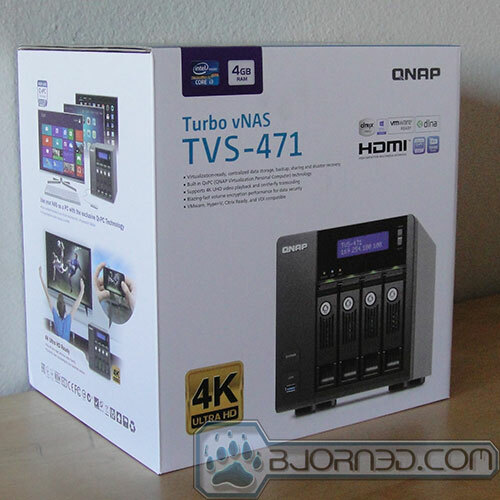 The TVS-471 continues with the same gray metallic exterior that QNAP has been using and while it is still classy and good-looking, we would not mind seeing the gold metallic used on the TVS-463. The front of the unit has the standard power button and a single USB 3.0 port, similar to what we have seen with other 4-bay unit from QNAP. A dedicated USB copy button surround the USB port for quickly copy the content off the USB drive to the NAS. We also get a handy mono LCD display with backlight support that shows us useful information such as IP address of the NAS. Additionally, we have the status LED for each drive bay and also for the system Status, USB, and LAN. 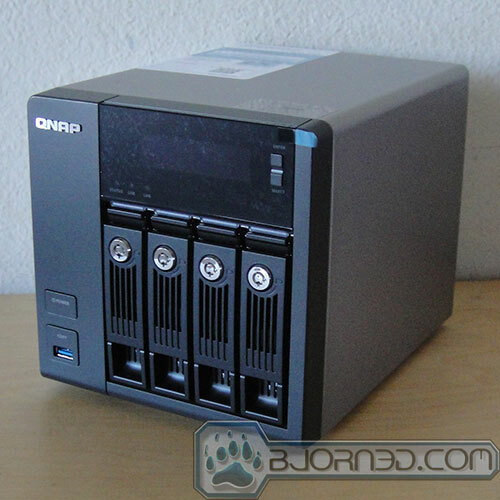 QNAP has been using the same design with the drive tray for as far as we can remember. The metal tray is very durable though it lacks some sort of noise-dampening material to help to reduce drive operating noise.They are easily removed from the NAS by just lift the handle on the front and pull it back and the tray with the hard drive will slides out the unit. Each drive can be locked with the included keys. The removable tray is even interchangeable across all of the QNAP NAS devices as you can see that we even manages to use the tray from the TVS-463 in the TVS-471. This makes is quite easy to migrate from old NAS to the new on without having to copy the contents over. QNAP’s firmware will even maintain the settings and data. 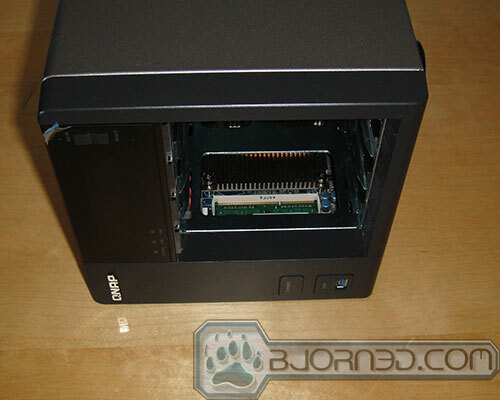 There are some ventilation on the handle of the drive bay to allow cool air to enter the NAS. Additionally, few extra ventilation holes are found on the side of the unit. The rear of unit has four more USB ports: two USB 3.0 and two USB 2.0 ports. The unit comes with four Gigabit Ethernet ports that supports Link Aggregation for up to 448 MB/s Windows upload and 444 MB/s download transfer speed. Additionally, we have one HDMI 1.4a ports, a Kensington Security Slot, Reset button, two PCIe expansion slot, and the power connector. A noticeably omission here is the eSATA port that we used to find some four bay NAS. Though, eSATA is dying technology so it is probably not something that most of us would be missing. Here we can see the 9 cm fan grille. Above that, we can see a small PSU fan. We are not a huge fan of the fan grille as the opening is a tad wide. While this allows maximum cooling performance, we are a bit worried that it can cause small object to fall into the NAS or if you are trying to connect a device without looking, you could accidentally get your finger into the fan blade. The HDMI port included supports video playback at 4K resolution up to 3840×[email protected] as it leverages on the Intel HD graphics on the Haswell processor so you an use it with your ultra high def displays. Though, we would love to see maybe one more port for dual display like what we can do with the TVS-463. Also, we would not mind if QNAP adds DisplayPort in addition to the HDMI as there are some ultra high definition display only comes with DisplayPort and no HDMI. Inside, the TVS-x71 comes with 512 MB DOM flash storage for the operating system, two DIMM slots for RAM. Our review unit, the TVS-471-i3-4G comes with 4GB of SODIMM DDR3 rated at 1600MHz, 1.35V. The entire TVS-x71 will support memory up to 16GB, so we can swap out the 4GB of RAM for higher capacity. Sadly, QNAP did not place the two RAM on the back of the motherboard for easy access like wha we have seen with older NAS. Instead you got one slot on the rear of the PCB which is easy to get to but the other slot is located underneath the hard drive bays which takes a bit of work to get to. It is still possible to install the RAM without having to completely taking the NAS apart if you remove all of the hard drives trays. Here you can see that with a bit caution, patience and dedicate fingers, we can install the RAM without tearing the unit apart. 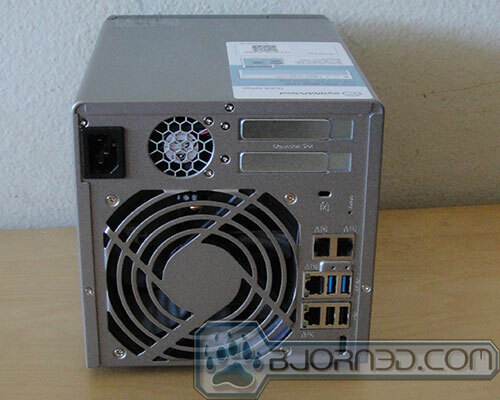 The unit comes with a 250W power supply with maximum combine 12V, 3.3V, and 5V output of 240W. The TVS-471 comes with two PCIe expansion slots. The black slot is a PCIe gen 3 x8 while the white slot is a PCIe Gen 2 x4. Both slots can be used with to expand the network to 10Gb. Thus, up to four 10Gb ports can be installed in addition to the four Gigabit ports preinstalled. Here, we get a peek of the CPU cooler with the heat pipes directing the hot air out of the rear of the unit. 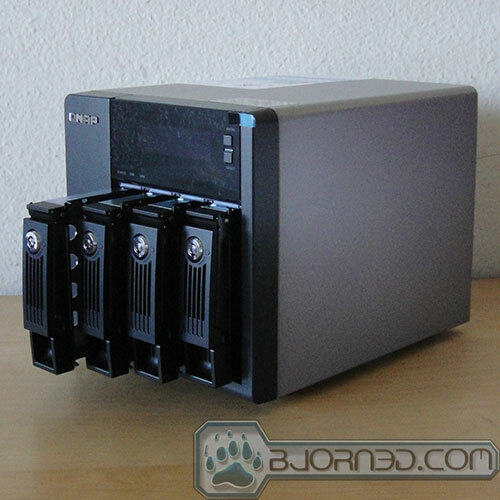 Lately, QNAP has been making NAS harder to take apart. It is still possible to do with the TVS-471 but you got to have some patience as it requires remove quite a few screws and parts in order to gain the access to the motherboard. The good news is that if you have the patience and the skill to do so, you potentially could upgrade the processor on the NAS for the additional performance since the entire TVS-471 NAS uses socket 1150 CPU. Since there is no quad core processor available for the 4 bay unit, you could potentially buy another compatible Haswell processor to boost the performance. 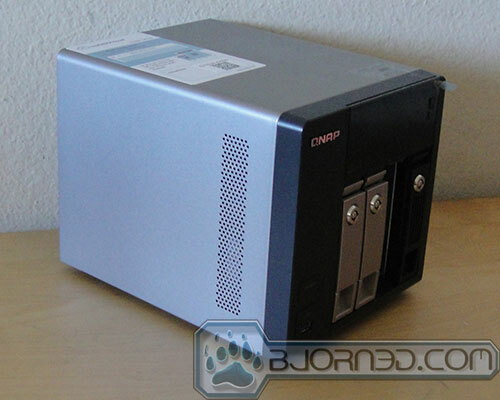 Clearly, QNAP would not sanction such mod so you can also expect to kiss the warranty good-bye. However, there is a chance that it would work if you stick with the i7-4790S or the i5-4590S as they are used with the larger capacity unit. 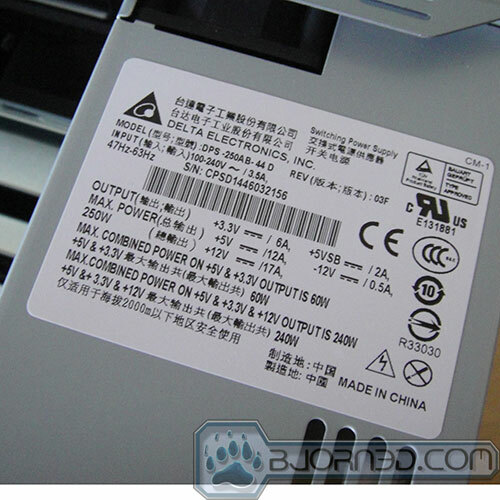 Besides the warranty, the thermal would be another issue that you may encounter since both of these CPUs are 65W model and the cooler that came with the TVS-471 is meant for the 54W CPU. Though, if you place the NAS in a cool environment and keep an eyes on the temperature, then you can get a big performance boost for a few hundred bucks ($204.99 for the i5 and $304.99 for the i7). As expected, wide range of protocols are supported with the TVS-x71. The system supports SMB/CIFS, NFS, and AFP for sharing file across Windows, Mac, Linux/UNIX. The Windows AD and LDAP service is also supported so system administrator to configure user permissions by using existing Windows AD server, LDAP server or built-in LDAP service. Up to 4096 users, 512 user groups, 512 share folders, and 1500 concurrent connection is supported. The unit will support 4 cameras at default but support up to 72 with the optional license purchase. Two USB webcam up to 1280×960, 5FPS for liveview or snapshots is also supported. The system supports EXT4 file system for the internal drive and external drive will support EXT3, EXT4, NTFS, FAT32, HFS+ filesystem. For storage, it supports RAID level 0, 1, 5, 5+hot spare, 6, 6+hot spare, 10, 10+hot spare, JBOD, single disk. A major distinction here versus the TVS-463 would be the RAID 5, 6, 10 hot spare support, which the TVS-463 is missing. We also get the AES 256 full volume encryption with built-in anti-virus, RAID recovery, Online RAID capacity expansion, Online RAID migration are all supported. The AES encryption and decryption is hardware-assisted on our i3 model so it should not have a huge impact on the system performance compare to the software based encryption. Just a note here, if you choose the model that came with the Pentium processor, it would not support hardware assisted encryption, so the Core based processor is what you would want if security is your top priority. Plenty of backup solutions are supported that includes real-time remote replication, NetBak Replicator in Windows, USB One Touch Copy, Apple Time Machine support, Real-time remote replication (RTRR) is also supported where data can be backed up to a remote Turbo NAS, FTP server, or to the Cloud. At the moment Amazon® S3, Amazon Glacier, Microsoft® Azure, ElephantDrive®, Dropbox® and Google Cloud Storage. Our TVS-471 can be purchased at retail price of $989 online. QNAP backs the NAS for 2 year warranty and offers optional extended warranty up to three additional years. You must purchase the extended warranty within 60 days from the date of purchase. 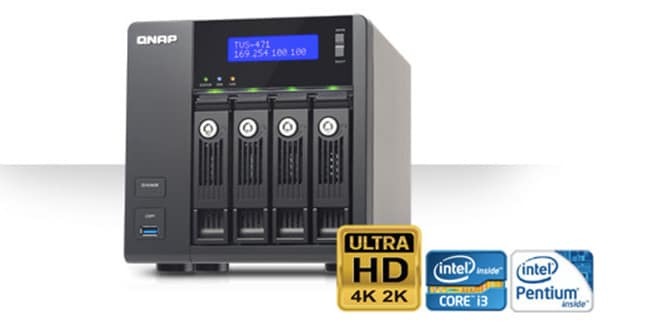 In addition, there is also option to purchase advanced replacement program which allows QNAP to send the replacement unit to you along with a prepaid return label. There is option to purchase the advanced replacement program for 2 year or 5 year and like the extended warranty, it must also be purchased within 60 days from the date of purchase. Unfortunately, the two programs are separated so you do not automatically get the extended warranty if purchase the advanced replacement program. Both programs only applies to the US and Canadian users at the moment. AS for the pricing, they are not cheap but it is small investment that may come handy for business users who need the NAS running at 24/7. The extended warranty for our TVS-471-4G is $131 (1 year), $272 (2 years), and $490 (3 years), and the the advanced replacement would cost you $459 (2 years) and $949 (5 years). If you want the best 4-bay NAS, then the TVS-471-4G is probably going to be the unit you want as it is packed with plenty of features and the performance.